Time is sure flying! We barely got the invites for our annual Pre-Thanksgiving potluck out in a socially acceptable time and now we're in full fledge meal planning, cleaning and project finishing mode. While this party is one of my favorite events of the year, a close second is Black Friday and since they are so close together, there is a lot of overlap planning. We tend to hold off on big purchases if we can until Black Friday to try to get a good deal and we take it really seriously. There is a lot of research for the best product, pre-shopping to check out the product in person (if possible) and searching through Black Friday flyers for the best deal. We also search for the lowest price pre-sale so that if we see it for a lower price we know it's a good deal. I started using blackfriday.com a couple of years ago and it definitely helps with the searching. You can search for a specific product and it will go through all of the black friday ads they have on file for you and pop up all the stores that are going to have that product on sale. You can also sign up for alerts when new black friday ads pop up. It seems like this week a lot of ads are finally coming out for this year and so I've been having fun going through our wish list looking for great deals. Here's what we're hoping to score on the biggest shopping day of the year. Shark cordless vacuum: Our Dyson cordless broke and it's the second time since we got it so we're going to try a different brand this time in the hopes that it will hold out a little longer. Rice cooker: We've had our little one for years now and it's lost all of it's non-stick-ness so we're looking to upgrade and this one at Kohl's is going to be a mere $10 so we're going to try and snag it. Surface Pro: This is a multi-reason purchase and it's hopefully going to go along with the next item. Our desktop is about to reach 10 years old and it just isn't reliable anymore. We recently got a back up drive to hold all our important files but since this is the computer Nate uses when he's not working, we needed something more functional than a back up drive for him. We also like the idea of having a tablet for travel. My advisor has the Surface Pro 2 and cannot stop raving about it and after looking into it, it seems to fit exactly what we need. TV/Monitor: While the Surface Pro is going to give a lot of mobile functionality, the thing we like about the desktop is the large monitor and for the work I do, a large monitor is necessary. Instead of getting a monitor though, we're thinking about getting a small TV that we can hook up my laptop or the Surface Pro to when we need the larger monitor. That way we also can turn it towards the playroom and set up a movie or Netflix when we want to without having anything hooked up. Plus you really can't beat the $79 price. Other things that look interesting are: A $120 Dutch oven for $24.99 and Pitch Perfect for $4. We're also hoping to get a programable thermostat for upstairs but I haven't found a good deal yet. 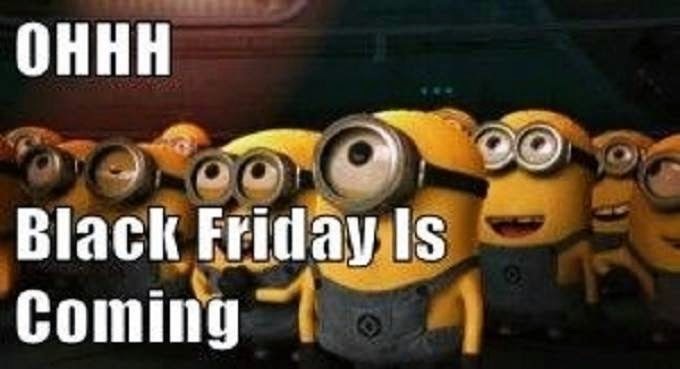 We usually try to buy online or go out mid day Friday, but we are willing to stand in line for a really good doorbuster. How about you? Are you the type that braves the crowds or do you hide out at home until the crazy's have gone home? *Post contains some affiliate links. Thank you for supporting Seesaws and Sawhorses!